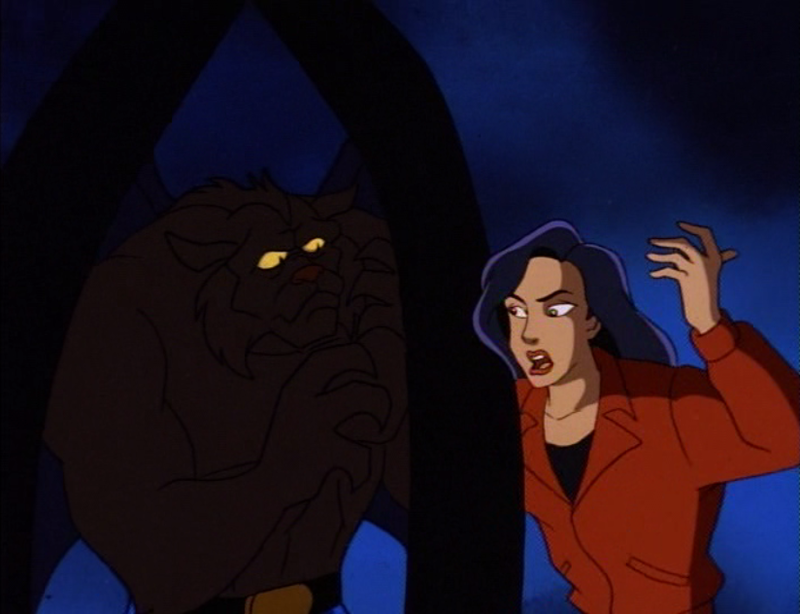 So after those 4,000 words screaming about how “The Mirror” CHANGES EVERYTHING, albeit drunkenly, we reach an episode that’s distinctly not this new changed Gargoyles that “The Mirror” promised. There’s no magic here, and in fact it’s about the most grounded story we’re ever going to get from this show. It’s a bottle episode, of sorts—well, not really, since it uses a whole bunch of new settings—but in the sense that it uses an extremely minimal cast and tight standalone story. It’s safe. It wraps up and doesn’t rely on much of what we’ve seen before. But you know what? No one said filler had to be bad, especially when that filler is a whole-plot homage to noir. 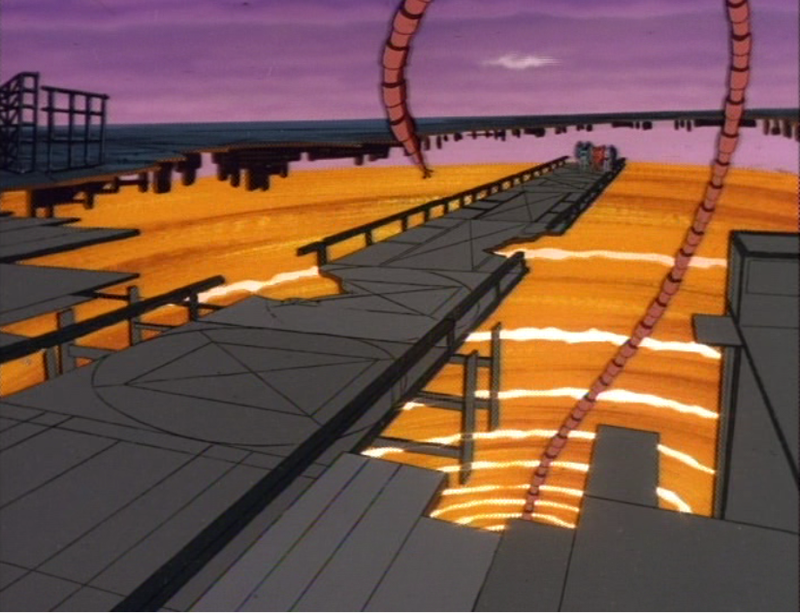 And as this episode points out, no episode of Gargoyles is unimportant. A lot of shows hit a turning point in season 2. Most of the time, these are big, dark or momentous occasions–a shocking twist, a major death, a big reveal–and from then on the show is never the same, and the momentum keeps going throughout its golden years. 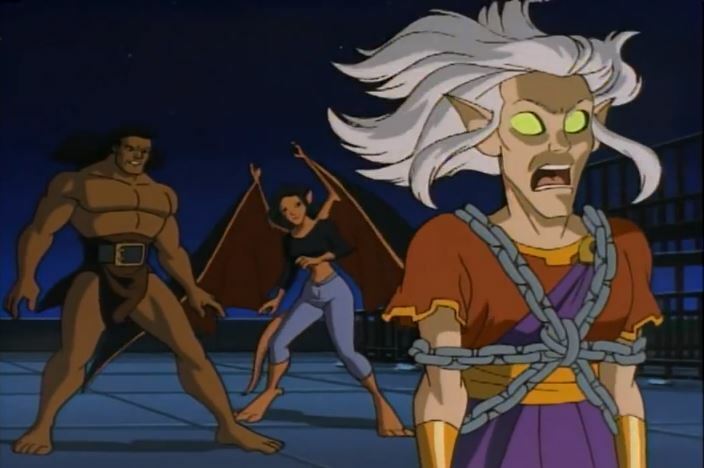 While we have some major multi-parters coming up, it’s this episode that really shakes up the landscape of the Gargoyles universe and its possibilities, even if it underplays it as a silly standalone comedy. Also, there’s no way Weisman and co. weren’t totally hammered while writing this. Because this mess is wacky. Oh, great. It’s that dreaded “kids’ TV show tries to teach kids how important reading is even though this is still a TV show” episode. 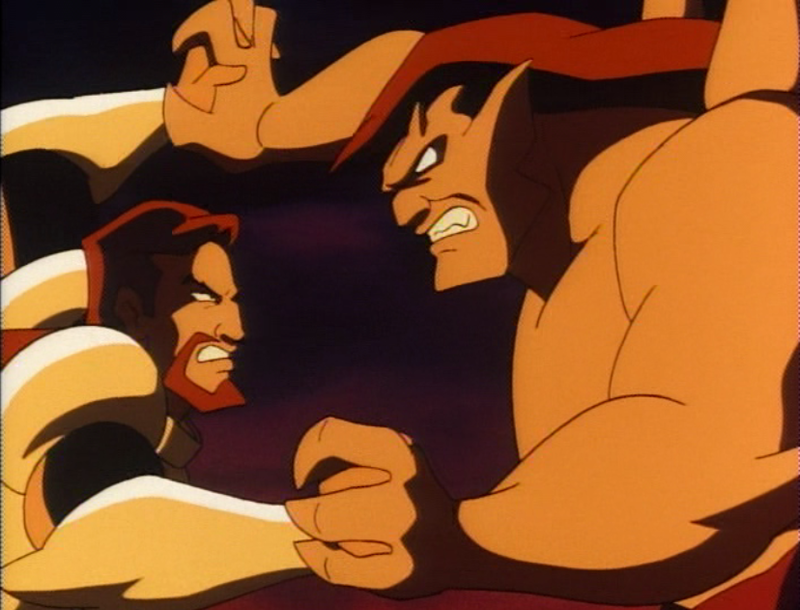 And this is on Gargoyles, which is supposed to be an action show, to boot. Shakespeare references are cool and all, but can the show talk about how “reading is awesome!” without beating us over the head with it? Spoiler alert: it can’t. But that’s okay, because it says other stuff, too. Shakespeare. Cyborgs. Virtual reality. Colorful video game outfits. Lovecraftian horrors. A love story. 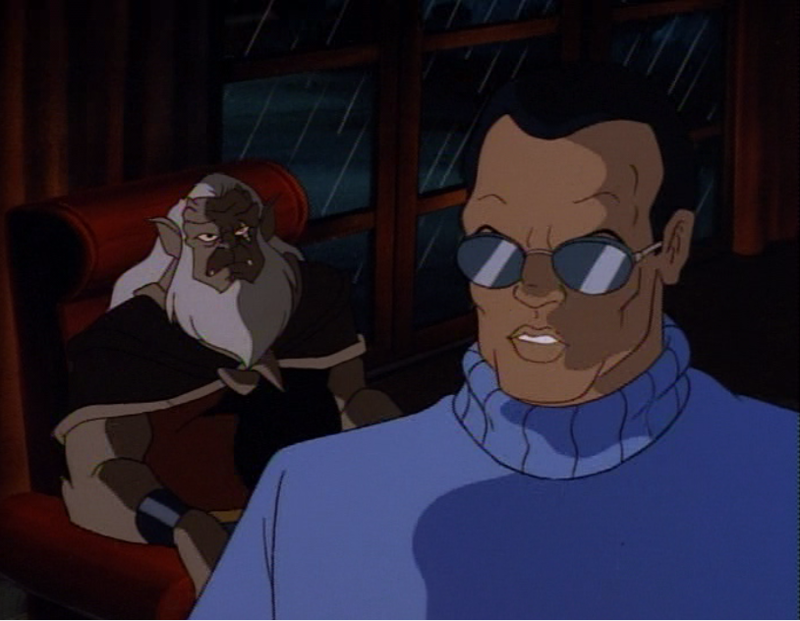 Our favorite Frankenstein-Worf Gargoyle, Coldstone, returns in the trippiest, most “EXTREME 90s” episode of Gargoyles thus far. It would probably be terrible if it were any show but this one. Remember that time you and your sibling had that falling out? Chances are, if you have a close relationship, you probably managed to work it out. You might not have gotten your brother/sister to see your side of things, but you still found ways to tolerate, forgive and ultimately enjoy each other’s company again. Love conquers all, and unconditional familial love is a very special, powerful type of love, right? Yeah, tell that to David Xanatos. Any good superhero team needs an opposing supervillain team. Even amongst the craziness this show has thrown out, The Pack is still the closest to feeling like colorful, wacky comic book villains. It also makes them the least interesting ones so far, but at least we can get some fun, mindless action out of them. It’s not like an episode about The Pack can yield anything with nightmare fuel or romance, right? 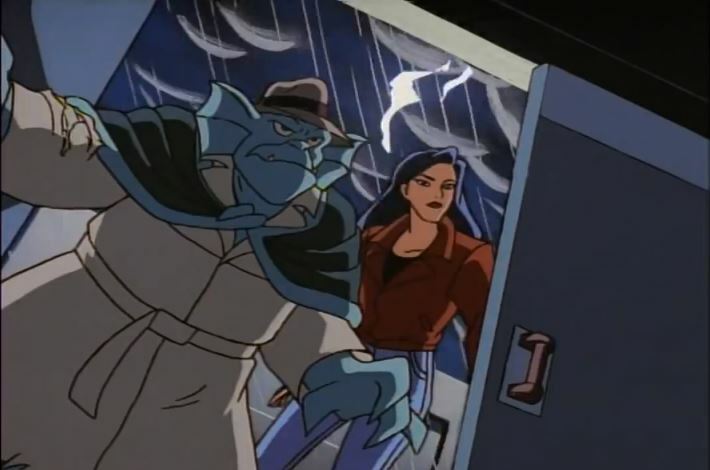 It took a little over 3 months for the first season of Gargoyles to air. It’s taken nearly six times as long for this blog to get through it. Pathetic as that may be, I’m cranking out a better workflow to get these pumped out throughout this year without unplanned breaks. The serendipity of it all? 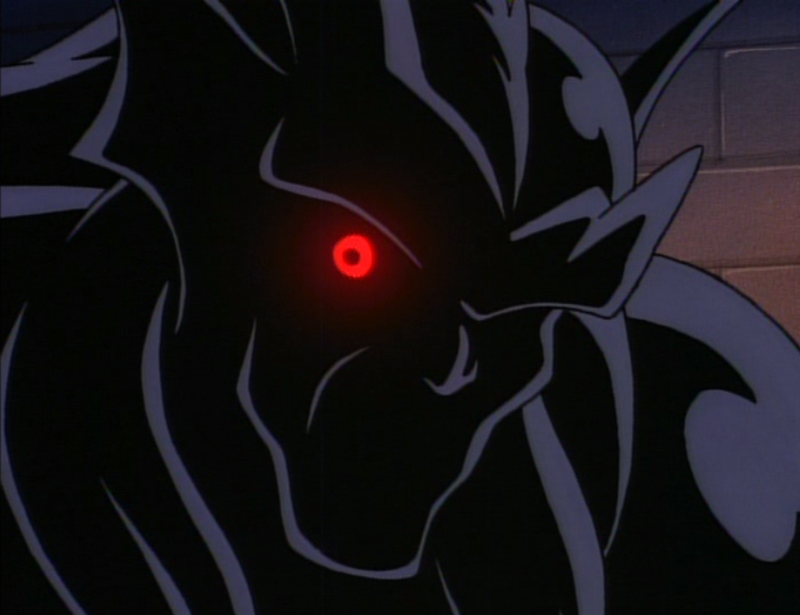 It’s now the top of 2014, the 20th anniversary of Gargoyles! Well, technically it will be the 20th anniversary in about 10 months, but you know…semantics, right? Semantics are actually a big deal in the first season finale of the show, so we’re going to break into the meaning of a big gargoyle mantra…by way of a cybernetic zombie, of course.